Why Do I Keep Forgetting I’m Afraid of Heights? 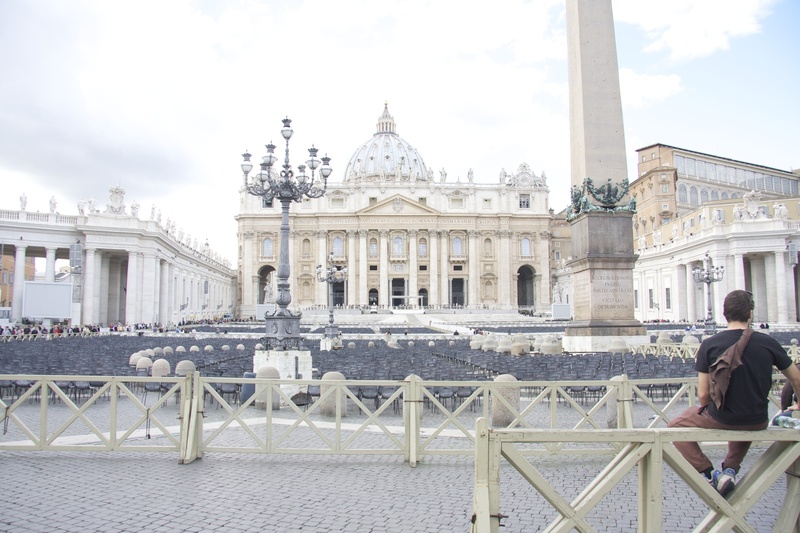 Fact 1: St. Peter’s Basilica is 138 m tall. Fact 2: 138 m is approximately 130 m taller than I’m comfortable with. This is a public service announcement for fellow acrophobics visiting Rome. 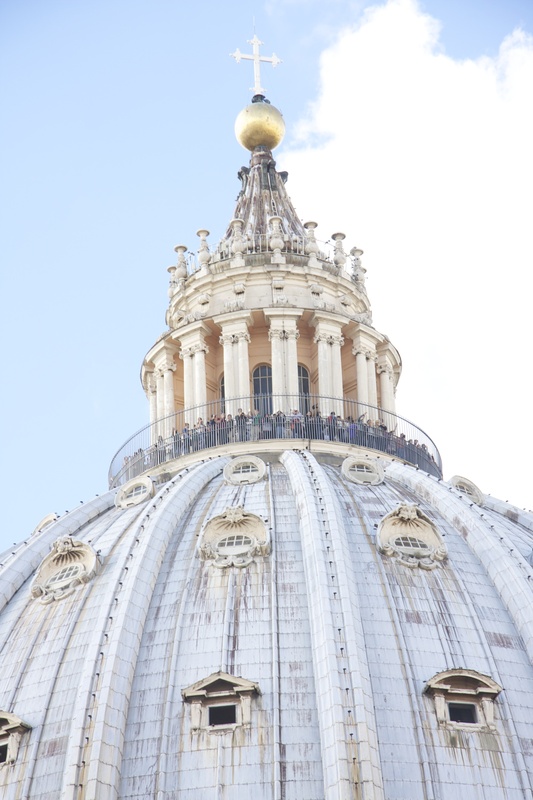 St. Peter’s Basilica is tall. It’s really, really tall. Just for reference, the words you can just barely make out along the rectangular portion of the basilica are eight feet tall. This was the best I could do when Andre said “Now smile.” I’m fairly sure I was the only one up there crying. Not that I was paying attention to anyone but me, and anything but the exit. 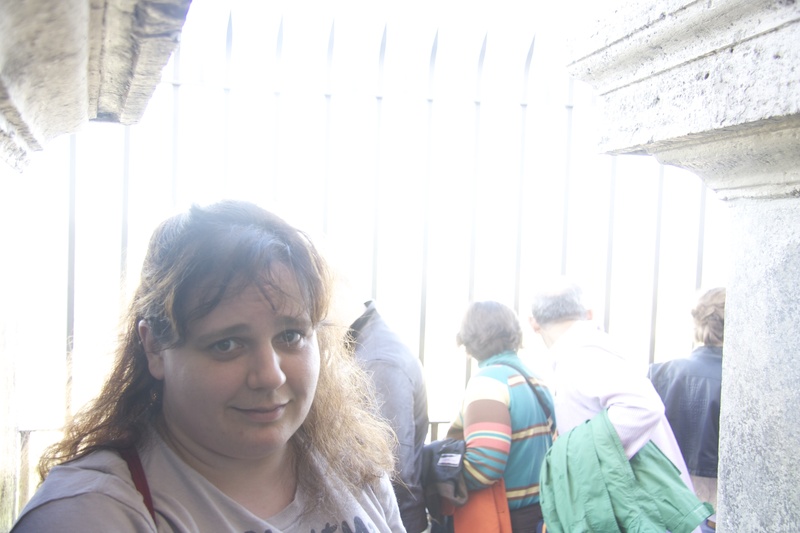 And while signs will tempt you to take the 320 step climb to the top, the view is just like the photos you can buy at the bottom. Or at least I assume it is. All I saw was stone. Stone floors and stone walls, slightly blurred by tears of terror as I avoided the view and attempted to become one with the wall until I found the staircase down. About half way up the dome part of the climb I started questioning my own sanity for undertaking the climb. Especially considering this was a uni-directional climb. There was a tourist on every step behind me and every step in front of me so changing my mind wasn’t really an option, the only way out was up. (Although I considered taking up residence in the stairwell and living off rainwater and granola bars thrown from other tourists attempting to squeeze past my terror frozen form. I still cringe when I see the people at the top. The fearless, ignorant people who’s inner voice is not screaming “we’re all going to die”. 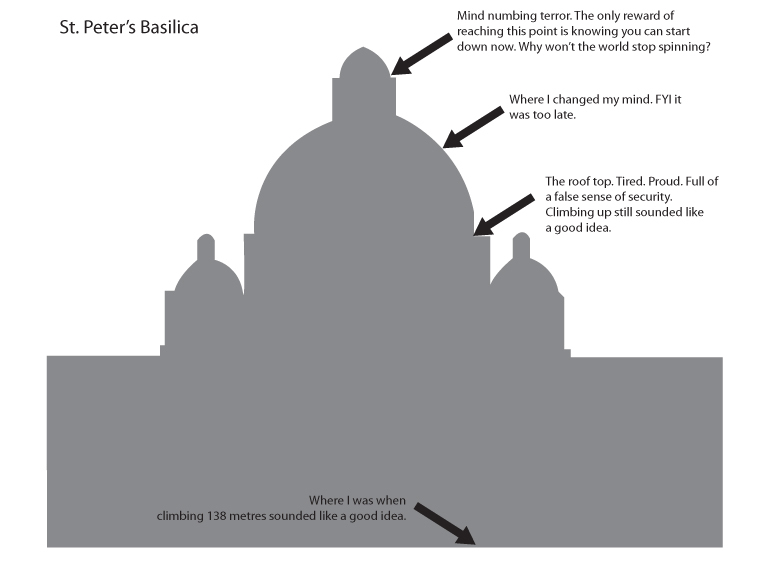 What I wonder now is if the prospect of a new experience (like climbing a basilica or jumping off a cliff) can make me temporarily forget my fear of heights, why can’t I find a way to forget my fear of failure? I only need to forget for a few hours at a time… (I need to send my novel off to some wonderful people I met at SiWC and I’m paralysed.) Maybe I should need to set my computer up on the roof, then make a brochure to convince myself that writing on the roof is a once in a lifetime opportunity. In good news though, I fought the fear this weekend. I wrote yesterday. (Thank goodness for writing friends.) I’m writing today, and I have plans to write tomorrow. Yay me! Do you have a bucket list of things to do? Do any of them scare you? Imagine a character who decides that before they die they need to conquer all of their fears by experiencing them all one after another. Happy writing.